When Space Systems Loral (SSL) shipped a high performance broadband satellite for Australia to launch base in late August 2015, the company reached an unprecedented milestone of providing 100 GEO communications satellites built using the SSL 1300 platform. As satellite technology has advanced, and demand for capabilities such as UltraHD television and high speed broadband to ships and planes has grown, the 1300 has evolved incrementally and has proven to be an exceptional platform for innovation. Satellite operators value heritage and on orbit reliability, combined with payload performance. Reaching this milestone provides tangible evidence of the 1300’s performance and reliability over the years and its value for demanding next generation applications. There are more SSL 1300s currently providing service on orbit today than any other model of GEO communications satellite. The first 1300, called SUPERBIRD-A, was launched in 1989 for Space Communications Corporation (SCC), a Japanese provider of commercial satellite services that subsequently became SKY Perfect JSAT. Named after it’s original dry mass of roughly 1300 kg, the satellite platform evolved out of a project to develop a 3 kW satellite, which was the highest power ever achieved at the time. Sky Muster, the 100th 1300, built for Australia’s new broadband network is shown here at SSL’s Compact Antenna Test Range inPalo Alto, California, where all the 1300s have been built. Photo is courtesy of SSL. Compared to SUPERBIRD, today’s 1300 provides eight times the power, 30 percent longer life, and can accommodate four times as many transponders. However, despite increasing complexity, each generation of the 1300 has proven to be more reliable than the last. Today’s broadband satellite for Australia provides a crucial service that hadn’t even been considered in 1989. The flexibility of the 1300 means that this will be a platform for future applications as well, including applications that we may not even conceive of today. As a company that embraces innovation, in the 1980s the SSL engineering team was forward-looking in creating a platform that allowed new technologies to be introduced incrementally. This highly successful approach maintains heritage and carefully manages risk for innovative new subsystems and design variations. 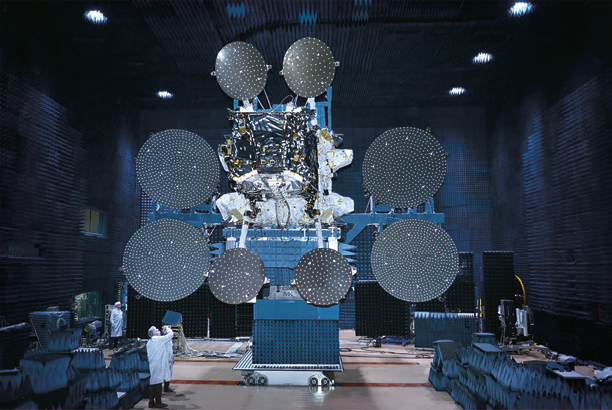 This satellite was launched in 1997 and was the first SSL satellite built for Direct-To-Home (DTH) television service. The satellite was enabled by the 1300’s first 100 volt bus and Direct Radiating Collector (DRC) amplifiers, which provided the power and heat dissipation necessary to transmit DTHTV. In the year 2000, SSL launched its first satellite built for Sirius XM Radio. This was the first 1300 to be launched into an innovative Highly Inclined Elliptical Orbit (HIEO). Together with two additional radio satellites, Sirius FM-2 and Sirius FM-3, the three satellite constellation has provided uninterrupted radio service. A fourth satellite, Sirius FM-4, was built as a ground spare; however, due to the constellation’s reliability, this satellite was never needed and may now be viewed at the Smithsonian National Air and Space museum’s Udvar-Hazy Center at Washington Dulles International Airport in Washington DC. Now known as ABS-4, this is a 1300 satellite currently providing service at the 61 degrees East orbital location. 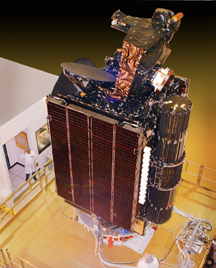 Launched in 2004, this was the first Western satellite to use electric propulsion, which is now regularly used in 1300 satellites to reduce propellant mass and allow for more revenue generating payload. In October 2015, SSL had 19 satellites with electric propulsion on orbit. MBSat was also the first 1300 to incorporate a large unfurlable antenna to enable it to broadcast to small mobile devices. The mesh antenna reflector measures 12 meters in diameter. 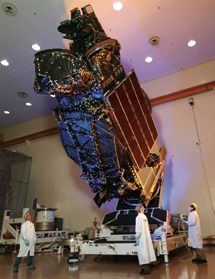 Launched in 2005, this was the world’s first high throughput satellite (HTS). IPSTAR was built using the SSL 1300 for Thaicom Public Company Limited (Thaicom), a company based in Thailand that provides satellite communications services. Over the past ten years, the IPSTAR satellite has provided advanced broadband service in the Asia Pacific region. An advanced satellite of the time of launch, IPSTAR offered 112 spot and regional beams that delivered 45 Gbps capacity. In order to meet Thaicom’s requirements for the satellite, which was the first to help bridge the digital divide by bringing Internet connectivity to remote areas, the 1300 supported a number of technology advances. 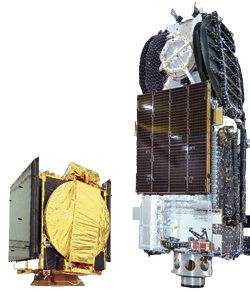 This was the first SSL satellite to use Lithium Ion batteries which are lighter and smaller than the older Nickel-Hydrogen batteries that have been commonly used on communications satellites. This was part of a new power electronics subsystem. This meant that more of the solar panel generated power was available to the payload and this technology has been incorporated into all subsequent 1300s. In 2008 SSL’s first 20-kW class 1300 was launched by EchoStar. EchoStar XI was built on the SSL 1300 platform for DISH Network and helped the DTH content provider roll out some of the first high definition (HD) television programming. An SSL 1300 satellite was installed at the Smithsonian National Air and Space Museum in 2012. Sirius FM-4 was a ground spare for the original Sirius satellite fleet. Photo is courtesy of Dane Penland. • The first satellite platform to provide two-way ground based beam forming which increases a satellite’s flexibility to meet changing market requirements. he platform’s ability to incorporate the most innovative technology continues to be evident on the one hundredth 1300, which was built for the new broadband network nbn™, Australia’s broadband network. 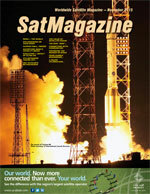 Originally called NBN Co 1A, the satellite was renamed Sky Muster by the six-year-old winner of a country-wide contest. The young girl, who depends on satellite Internet for her education, selected the name for the name’s reference to the gathering of cattle, which captures how the satellite will help ‘round-up’ and connect Australians. Sky Muster is a highly advanced satellite, which exemplifies the 1300’s evolution. The satellite’s unique architecture uses tailored spot beams to match the widely varied population distribution in Australia. Sky Muster will be capable of providing peak download speeds of 25 megabits per second for hundreds of thousands of people who do not otherwise have access to high speed Internet. The satellite will also supplement the fixed line and fixed wireless services provided by nbn™. Sky Muster is the first 1300 to mount eight large antenna reflectors using a unique boom configuration and includes new, advanced low noise amplifiers to improve radio frequency (RF) performance. The satellite also uses a new, third generation, high capacity Li-ion battery for reduced mass. SSL is building a second satellite for nbn, which will launch in 2016—this will be one of the first 1300s to use 3D printed flight parts. A comparison of the first 1300 and the 100th 1300—Sky Muster is nearly six meters taller than SUPERBIRD-A. The images are courtesy of SSL. As a platform that has the ability to accommodate the most innovative satellite technology, the 1300 can meet the demands of future applications, such as 4K/8K ultra-high definition television (UHDTV), communications services for ships, planes, buses and trains and the Internet of Things (IoT). SSL continues to qualify advances for future use on the 1300 with a focus on adding standardization and flexibility. 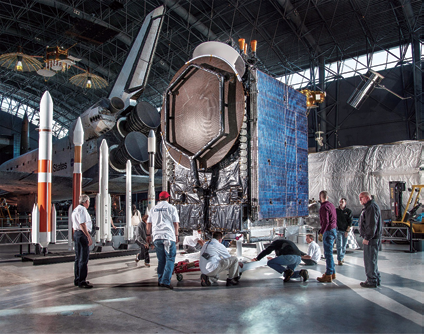 SSL works closely with customers to incorporate innovations that will support the high performance, better economics, and increased accessibility that will broaden the appeal of satellite-based solutions. The 1300 will continue to provide the value and adaptability that satellite operators need to support next generation applications. SSL is working to ensure that the next one hundred 1300s reflect dramatic improvements in cost, schedule, mass, and flexibility. SSL thanks and congratulates all of its customers who have helped it achieve the goal of 100 1300s.